Grain bowls have become a popular choice for healthy lunch and dinner dishes both online and in restaurants. They are great because you can load them with all kinds of nourishing fruits, vegetables, and lean protein, all on a base of healthy whole grains. These components should all be part of your diet for good blood pressure, so making a grain bowl is a great choice if you’re trying to lower yours. 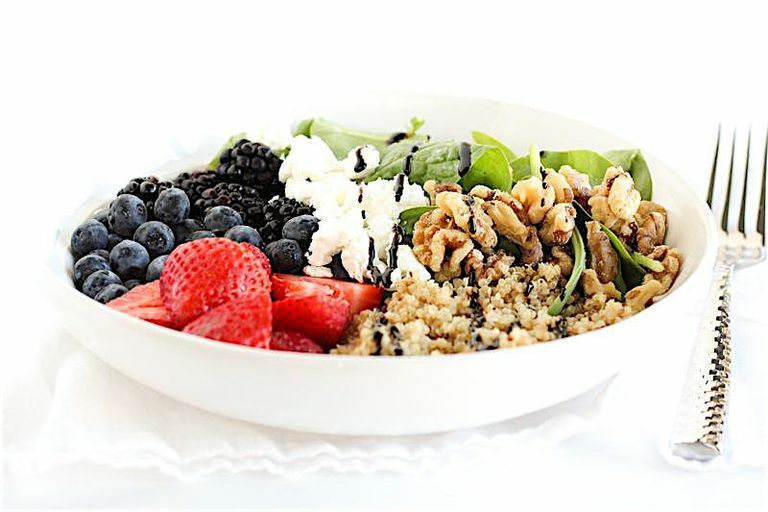 This berry balsamic quinoa bowl takes advantage of fresh summer berries along with fresh spinach, heart-healthy walnuts, and creamy goat cheese, all topped off with a sweet and tangy balsamic reduction. Quinoa provides a fluffy, fiber-rich base that blends all the flavors together perfectly. It’s a delicious bowl that you can pack for lunch. Add your favorite lean protein, like chicken or tofu, for a light dinner. Place spinach and quinoa in a bowl. Remove green tops from strawberries and slice. Add strawberries, blueberries, and blackberries to bowl. Sprinkle crumbled goat cheese and walnuts over the top of the bowl. In a small saucepan, heat balsamic vinegar over medium heat until reduced to a thick consistency. Pour over bowl and serve. You can use any whole grain as the base of this bowl, such as farro or brown rice. If you don’t like goat cheese, feta or blue cheese work well with the berries, or leave it off completely for a dairy-free version. Cook your quinoa in low-sodium chicken or vegetable stock for even more flavor. Serve with grilled chicken, shrimp, steak, or tofu to make this bowl a more hearty meal for dinner.